Recent negotiations between Governor Kitzhaber and two public employee union groups, SEIU and AFSCME, produced a win for union members. Between permanent pay raises, healthcare benefits including vision, dental and life insurance, and a continuation of the 6% PERS pickup, these union members are receiving a net pay increase of nearly 3.5%. So who is responsible for paying these increases? Taxpayers. Which begs the question: With a $650 million hole in our current 2011-13 state budget, how can we afford such increases? The current budget was passed with $650 million worth of assumptions; spending cuts and cost savings that have little hope of materializing. With state revenue likely to fall short of expectations and increasing state liabilities, the hope that we can grow our way out of this budget shortfall and maintain our spending levels is unrealistic. Translation: The legislature put off making the tough decisions on spending, and now the Governor has put even more responsibility on the backs of taxpayers. According to an estimate from the American Enterprise Institute, Oregon has a nearly $42 billion unfunded pension liability. 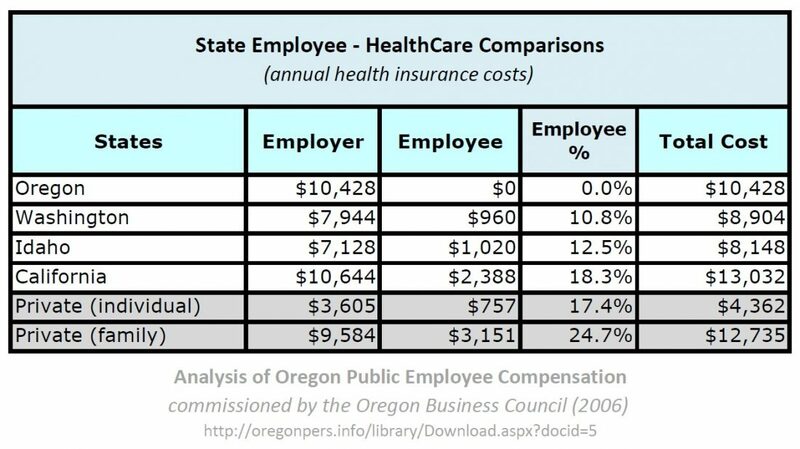 Under this estimate, every employed Oregonian is responsible for $28K towards public employee retirement. The private sector in Oregon, which makes up about 82% of state employment, has seen a loss of over 110,000 jobs in the last four years. Private sector employees pay upwards of 30% for healthcare costs, and with the majority of them holding defined-contribution retirement plans, they have experienced significant retirement fund losses due to the stock-market collapse. How long can the private sector withstand the burden of propping up benefits received by only 18% of the employed population? Oregon’s major teachers union, The Oregon Education Association (OEA), is seen by many observers as the big loser coming out of the recent legislative session in Salem. Why? Because it failed to convince enough legislators to stop some modest school choice bills from passing. It also couldn’t stop Governor John Kitzhaber, whom it endorsed and financially supported, from agreeing to sign these bills as part of a larger education reform package. The highest profile bill in question was House Bill 2301, known as the virtual public charter school bill. The union has been trying to shut down online public charter schools ever since they started making inroads several years ago. This year it had hoped to cripple these schools, which it sees as competition to the brick-and-mortar schools in which its members teach. Instead, the legislature agreed to let these online schools expand from teaching about one percent of the state’s K-12 students now up to at least three percent of students in any and all school districts around the state. This revelation calls into question which online schools are real and which may appear to be real, but are not. Schools like Oregon Connections Academy and Oregon Virtual Academy are real schools with hundreds of real teachers educating thousands of real students across the state. The Oregon Department of Education manager who oversees the Virtual District says that it is not an alternative to online charter school offerings. “We are not set up to compete with them from a financial point of view,” he says. * Real online charter schools, paying real teachers to teach real students, receive on average less than 5,700 public dollars a year for each enrolled student. ** A simple calculation tells us that the $7 million allocated to the Virtual District so far could have been used to teach at least 1,200 students for one school year, or 200 students over the six years it has received state funding. But, again, so far the district has taught zero real students. The teachers union keeps calling for more accountability from Oregon’s real online public charter schools, the ones with real teachers educating real students. It seems far past time for state legislators and taxpayers to call for accountability on the part of the Oregon Virtual School District. What have we gotten for $7 million in this “district”? If the answer is “not much,” then we should close it down and refocus our energy and resources on real schools with real students. Oregon’s online public charter schools are not virtual; they are real schools where real learning occurs. Just because their teachers may not wear the union label shouldn’t give OEA the right to stop them from competing with the brick-and-mortar schools its members occupy. Parents and students hold real online public charter schools accountable every day as they freely enroll and disenroll. More school choice will give more parents and students that power over brick-and-mortar schools as well. If OEA wants to keep students in classes taught by its members, it should figure out how to do that without holding the kids hostage. All students and their families deserve the right to choose where they get their education. Anything less is a disservice to them and to the taxpayers. * “Virtual Combat: Oregon’s teachers union hates online charter schools. But its alternative has little to show for millions of taxpayer dollars,” Nigel Jaquiss, Willamette Week, July 20, 2011, http://www.wweek.com/portland/article-17755-virtual_combat.html. ** “Unintended Consequences: an analysis of charter school funding in Oregon”, Vanessa Wilkins, Northwest Center for Educational Options, April 21, 2010http://www.nwceo.org/pdf/NWCEO_Charter_School_Funding_Study_May_2010.pdf. The average Oregon public charter school received slightly over $5,700 per student in 2008/2009 according to the Oregon Department of Education Financial Database, depending on the district that charters them. Current online charter schools are chartered in districts that pay less than this amount; but if the Oregon Virtual School District were to accept students statewide, it likely would receive closer to the average charter payment per student. Note that the $5,700 average per student charter school funding is approximately half the total public funding of brick-and-mortar public schools in Oregon. Source: Which Oregon School District Teaches No Students? Public education exists to serve children – period. However, as evidenced by the Oregon Education Association’s (OEA) ongoing actions, some believe public education should serve primarily the adults who work in the system. Thankfully, this legislative session, Oregon’s state leaders concluded otherwise. After tense negotiations on several education-related bills, Oregon’s legislature passed the most substantial education reforms Oregon has seen in decades, at the governor’s request. The more “controversial” elements of that package will provide students – who find their traditional public schools unsuitable – more educational options from which to choose, including charter and online schools. Such student-focused, choice-based measures were a particular pebble in the OEA’s shoe. Why? Choice threatens the OEA’s monopolistic hold on public education. That grasp has allowed the OEA (a union) to become Oregon’s most financially powerful special interest group, lobbying for, well, itself. So when something undermines that power – even if that something is beneficial to children – the OEA will stand in the way, as it did this legislative session. Oregon families should be grateful the OEA lost and the governor and legislators led. Now, many children in need of a better education no longer will be held hostage. Now, if charter school applicants are denied by districts, they can appeal to public colleges for sponsorship, providing a new avenue for charters to grow. Although public colleges will be able to sponsor just one charter each, this should help hundreds of families find the schools for which they are looking. Many Oregon families also have been waiting for access to virtual, or online, charter schools. Currently, Oregon’s virtual charters are operating under an enrollment cap that has kept many kids from using this innovative option. Online learning is emerging as a cutting-edge way for students to have wider access to courses that otherwise might be unavailable to them. If Oregonians want to enroll their children in such schools, why not let them? Thanks to state leaders, kids now will be able to access any virtual charter school without having to obtain their local district’s permission – at least until three percent of that district’s students are attending a virtual school. Although still unnecessarily limited, this improvement will be life changing for families who have been denied entry. It also will make it easier for families who have received permission but have had to wade through the same transfer paperwork year after year. The third choice measure that will benefit Oregon students essentially carries charter schools’ open-enrollment policy over to traditional public schools. Today, it is difficult, if not impossible, for parents to enroll their children in out-of-district public schools because districts often refuse to let kids transfer. Now, parents will be able to enroll their children in any public school, as long as the receiving school district is accepting transfers. In short, districts no longer will be able to force kids to stay in their local public schools if they’re able to get a public education elsewhere. The OEA claimed that giving parents such choices creates financial instability for schools (by losing transferees). Other states, which have such policies in place, seem to cope. Why can’t Oregon? Moreover, this begs another question: Does the OEA believe that it and traditional public schools are entitled to students? If parents choose to leave a school, that suggests something is either wrong with the school or, even if the school is “good,” their children’s needs aren’t being adequately met. In both instances, parents believe they can find a better fit for their kids elsewhere. If the goal of public education is to educate, why deny children access to schools that could do a better job of educating? Oregon’s lawmakers and governor finally are answering that question. They’ve put partisan politics aside to support reforms for which thousands of Oregon families have been waiting. There still is much work to be done to ensure Oregon’s children – not the OEA – are the true beneficiaries of public education. But this start will show Oregonians that the sky doesn’t fall when choice is incorporated into public education; it gets brighter. Christina Martin is a policy analyst and the School Choice Project Director at Cascade Policy Institute, Oregon’s free market public policy research organization. Why is Oregon’s economy continuing to decline relative to other states? According to the 2011 American Legislative Exchange Council‐Laffer State Economic Competitiveness Index report, which forecasts and ranks the 50 states with respect to economic performance and economic outlook, Oregon has been declining in its economic outlook rank since 2008, ranking 35th, 39th, 41st, and now 43rd in 2011. So what are the reasons behind Oregon’s economic decline? 1) States with no income tax outperform high income tax states. Oregon is now tied with Hawaii for the highest income tax rate in the nation. Since Measures 66/67 have gone into effect in January 2010, Oregon has lost approximately 8,000 high income tax‐filers, resulting in loss of state revenue and countless jobs. Oregon ranks 48th for highest corporate income tax rate. 2) States with right‐to‐work laws grow faster than forced unionism. Oregon is 1 of 28 states requiring employees of unionized employers to become union members, pay union dues, or face loss of employment. According to the article, “between 2000 and 2008, 4.8 million Americans moved from forced‐union states to right‐to‐work states. That’s one person every minute of every day.” With Oregon’s state revenue forecasts continuing to fall short of expectations and our increasing public employee benefit obligations, without policies that promote economic growth, Oregon will continue to rank at the bottom of economic performance nationwide. Source: Why is Oregon’s economy continuing to decline? Mediation continues in Salem between two major labor unions and Governor John Kitzhaber’s team over public employee benefits. The governor is seeking concessions from SEIU and AFSCME regarding the Public Employees Retirement System (PERS) and the state employees’ health insurance plan. PERS members pay 6% of their salary towards retirement. Currently, the state pays for this mandate as part of a previous deal. The state also pays 100% of employees’ health insurance premiums. It’s no secret that Oregon is facing budget shortfalls, including financing for public employee benefits. Attempts at legislative reform have largely failed. State negotiators initially aimed to end the 6% pick-up and to require that employees pay 5% of insurance premiums. They have since dropped the pick-up demand. Union supporters argue state employees have already made concessions by forgoing certain wage increases in favor of hardier retirement benefits. However, this still does not account for free health insurance premiums or the wealth of other benefits union membership provides. SEIU Local 503 members are eligible to receive, among other things, free life insurance and legal compensation. AFSCME members get heating oil and rental car discounts. The worst case scenario of not being able to fund state employee benefits is bankruptcy. Making a few concessions wouldn’t be a bad idea, and Oregon taxpayers likely would agree. Christopher Robinson is a research associate at Cascade Policy Institute, Oregon’s free market public policy research organization. During last year’s gubernatorial race, the two public employee unions, SEIU and AFSCME, endorsed John Kitzhaber and contributed $750,000 to his campaign. Unlike the education unions who backed Bill Bradbury in the primary, AFSCME endorsed John Kitzhaber in the primary. SEIU remained neutral during the primary, but endorsed Kitzhaber during the general election. As governor, the same John Kitzhaber who was so heavily supported by these public employee unions was then tasked with renegotiating their contracts; an inherent conflict-of-interest. Not surprisingly, the public employee unions made out much better than the taxpayers did. Kitzhaber recently renegotiated the contracts for SEIU and AFSCME, and the result was three permanent pay raises for the unions, continued gold-plated health care coverage, and no change to the 6% PERS employee pickup. The public employee unions’ gold-plated health care coverage includes medical plans with no deductibles, and coverage for dental, vision and life insurance. The small victories for taxpayers were a continuation of temporary furlough days and the requirement for state public employee union members to start paying up to 5% of their health insurance. Even after factoring out the furlough days and 5% health insurance, Kitzhaber’s agreements will still result in a net increase of over 3.5% in pay for the average SEIU & AFSCME worker in the current budget. And pay isn’t the only payroll cost that taxpayers will be bearing. PERS retirement costs are expected to increase by almost 15% in the next four years, and health benefits for state workers are expected to increase by over 25% in the next three years – and 95% of that will be paid for by the state. Note: unlike SEIU & AFSCME, most teachers and other school employees have already been paying for part of their health insurance and they have plans which include deductibles. Based on the concern that Kitzhaber was “fully supported by the public employee unions”, Carender also relayed this concern: “How can taxpayers be sure that Kitzhaber won’t betray them in order to satisfy his union base when push comes to shove?” How, indeed? The report went on to provide a number of recommendations for controlling payroll costs. One example recommendation for controlling health benefit costs was to “Establish deductibles and co-payments in line with industry standards” for health insurance, and another example recommendation for controlling payroll costs was to reduce the 6% PERS payments to the Individual Account Program to 3% or lesser amounts. Over the last 4 years, the private sector has lost 110,000 jobs while the number of state employees has grown by 6,400. Oregon’s unemployment rate remains way too high: 9.4%. 187,000 Oregonians are still out of work – double the number out of work 4 years ago. 780,000 Oregonians are on food stamps. That’s 1 in 5 Oregonians on food stamps. Governor Kitzhaber hasn’t followed his predecessor’s recommendations to avoid a decade of deficits. The governor should have demonstrated to Oregon employers, Oregon investors and Oregon taxpayers that Oregon is serious about controlling state spending and that public employee unions will begin paying their fair share.